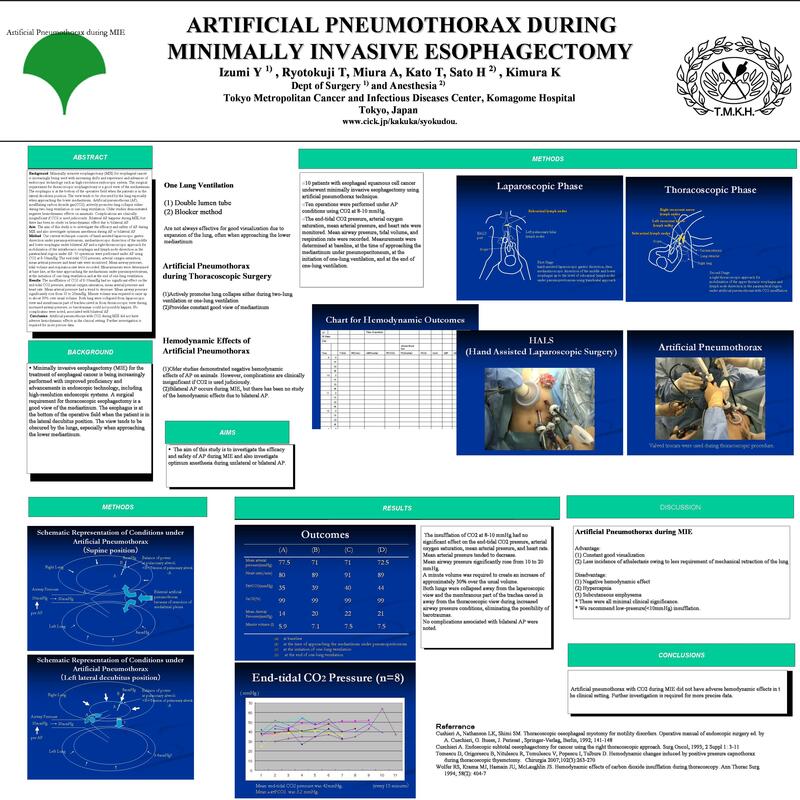 Background: Minimally invasive esophagectomy (MIE) for esophageal cancer is increasingly being used with increasing skills and experience and advances of endoscopic technology such as high-resolution endoscopic system. The surgical requirement for thoracoscopic esophagectomy is a good view of the mediastinum. The esophagus is at the bottom of the operative field when the patients is in the lateral decubitus position. The view tends to be obscured by the lung especially when approaching the lower mediastinum. Artificial pneumothorax (AP), insufflating carbon dioxide gas(CO2), actively promotes lung collapse either during two-lung ventilation or one-lung ventilation. Older studies demonstrated negative hemodynamic effects on annimals. Complications are clinically insignificant if CO2 is used judiciously. Bilateral AP happens during MIE, but there has been no study on hemodynamic effect due to bilateral AP. Aim: The aim of this study is to investigate the efficacy and safety of AP during MIE and also investigate optimum anesthesia during AP or bilateral AP. Methods: Our current technique consists of hand-assisted laparoscopic gastric dissection under pneumoperitoneum, mediastinoscopic dissection of the middle and lower esophagus under bilateral AP and a right thoracoscopic approach for mobilization of the intrathoracic esophagus and lymph node dissection in the paratracheal region under AP. 10 operations were performed under AP using CO2 at 8-10mmHg. The end-tidal CO2 pressure, arterial oxygen saturation, mean arterial pressure and heart rate were monitored. Mean airway pressure, tidal volume and respiration rate were recorded. Measurements were determined at base line, at the time approaching the mediastinum under pneumoperitoneum, at the initiation of one-lung ventilation and at the end of one-lung ventilation. Results: The insufflation of CO2 of 8-10mmHg had no significant effect on the end-tidal CO2 pressure, arterial oxygen saturation, mean arterial pressure and heart rate. Mean arterial pressure had a trend to decrease. Mean airway pressure significantly rose from 10 to 20mmHg. Minute volume was required to raise up to about 30% over usual volume. Both lung were collapsed from laparoscopic view and membranous part of trachea caved in from thoracoscopic view during increased airway pressure, so barotraumas could not possibly happen. No complicatins were noted, associated with bilateral AP. Conclusion: Artificial pneumothorax with CO2 during MIE did not have adverse hemodynamic effects in the clinical setting. Further investigation is required for more precise data.